TruCountry: James Intveld performs "Lets get Started"on TruCountry Show. 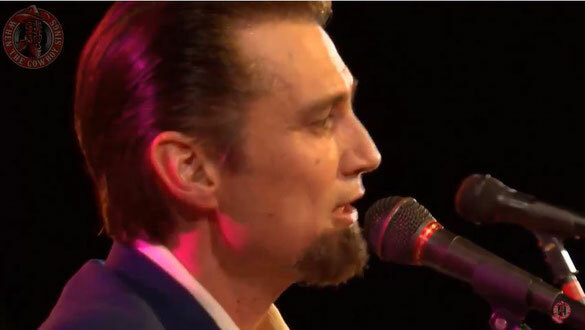 James Intveld is a native of Los Angeles who started his career at an early age listening and singing along to his parents' recordings of Hank Williams, Sr., Dean Martin, Lefty Frizzell, and Elvis. During the cow punk movement of the '80s, Intveld was working the same clubs as Dwight Yoakam and Rosie Flores, playing his own brand of rockabilly. He so impressed "Town South of Bakersfield" producers Pete Anderson and Dusty Wakeman that he was included on the second volume of the compilation series. As a multi-instrumentalist singer, songwriter and sideman, James’ name seems to crop up everywhere. He’s in high demand for his skills as a player; as adept at the slap bass, slide, steel, and drums as on guitar. He’s done everything from playing bass with Dwight Yoakam to lead guitar with the Blasters. Intveld wrote the Rosie Flores hit "Cryin' Over You" as well as all the material on his own first 1996 effort "James Intveld." That was named the best studio recording project and the best country or roots CD of 1996 by California's Music Connection magazine. Intveld successfully produced, arranged, sang, and played all the parts on this magnificent release, dedicated to his brother and best friend, Ricky.